I have finished the last bit of sewing on the last of the Round Trip Quilts. I'm a little sad about that fact, to be honest. This has been a great group of women to work with, and it has been fun to see what everyone has added to the quilts each round. I'm very happy and excited that my quilt will soon be making its way home to me, but also sad to know that Jennifer won't be mailing me a new quilt to work on every few weeks. 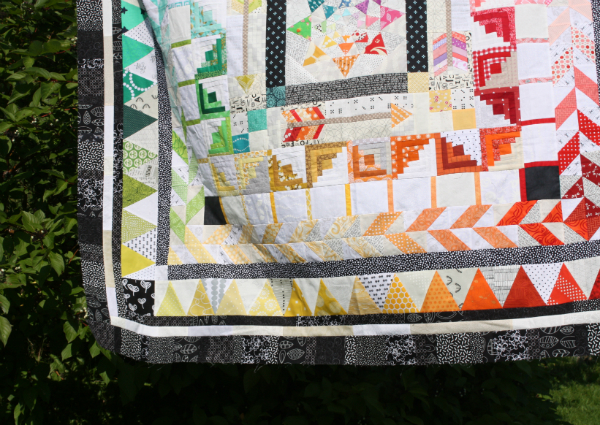 However, this last quilt is a real beauty! 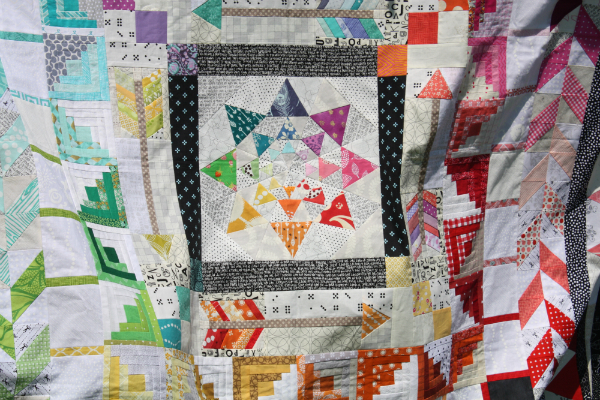 This quilt belongs to Mary, who blogs at See Mary Quilt, and it is so full of gorgeous colour. Mary started us off with this rainbow star and the others kept the rainbow colour order going around the center. Since I would be the last one to add to the quilt, I decided it needed a dark frame which would also echo the dark borders that had already been added. I ended up adding three borders - a narrow black/white border, a narrow low volume border and then a wider black/white border. All three are somewhat scrappy. Thanks to Mary, Jennifer, Heather, Chelsea, Christina, Kim and Liz for making this round robin bee such a great experience! I love it! That last border is the perfect ending for the quilt. I can't wait to get it back and quilt it! It really needed that last set of dark frames. It ties the beginning in with the rest of the quilt nicely. I doubt Mary is going to take you up on the offer to keep this one! That is beautiful! Sounds like it was very special to make as well. That frame is perfect Leanne! I'll miss this group too... Although I don't know if I could keep up with it for another year if we weren't done. It was fun! Wow! What a gorgeous quilt! And I agree... your frame is perfect. Beautiful! I think your borders finished it off nicely. It now says, "Done." Round robin quilts can be so inspiring to work on. This one is wonderful -- love the bright colors. 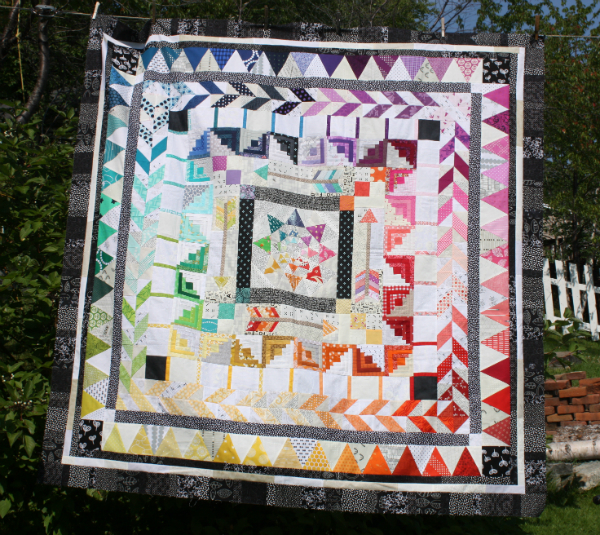 What a gorgeous, gorgeous quilt! I love the round robin concept so much, it really comes together so nicely in the end! Love the frame you added. It does complete the quilt nicely. I love the colours and the patterns of each boarder look great. Your frame boarder finishes it beautifully. That looks like one person designed it--always the goal of group projects. Lovely! It looks lovely! You and your group did a fabulous job! Oh wow that's amazing!!! Are you going to have as much fun quilting it?! Frames it perfectly - lovely result. Well done to all!